During the summer, on our annual family trip, we travelled to Sweden to escape the heat and to experience first-hand all those features we admire about this country: the intense relationship with nature, a vigorous urban culture with a great interest in all related to healthy food, and in general the importance given to design. By Susana Canogar. First stop: Stockholm. The great surprise was the suffocating heat we experienced as we left the airport!! The temperatures over 30ºC (90s in F), with suffocating heat at night, more than we had been experiencing in sunny Spain! But the city of Stockholm is an oasis of greenery and water among buildings. Across from a built shore, another of deep woods, so that the city in reality is a perfect yin and yang between built areas and nature. 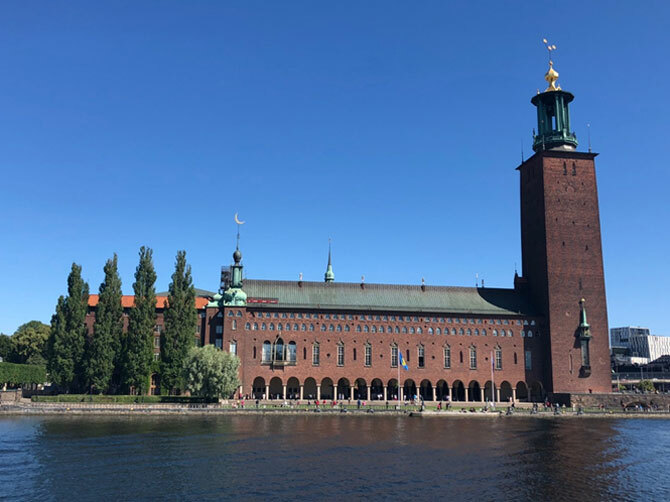 One of the best ways of getting a lay of the land is by boat, followed by a stroll through the island of Gamla Stan, the medieval nucleus of the city, to discover charming plazas and curio shops, as well as visiting monuments such as the Royal Palace, the Cathedral or the Nobel museum. Walking around the island museum (the Vasa Museum is a must) and the Djurgarden park, we discovered the mysterious giant effigies of Jaume Plensa, now almost a standard in many cities of the world, and the Rosendal garden, a farm-to-table operation where you can order delicious and healthy food from the large vegetable garden, buy plants or garden ornaments in the greenhouses of the complex, or even talk to the beekeeper about the waning population of bees. A very rural experience in the heart of the city. Making use of the excellent metro and local train system we visited Skogskyrkogarden, an unpronounceable name meaning woodland cemetery, whose iconic images in the landscape field seemed an essential visit. Designed by Gunnar Asplund and Sigurd Lewertz, and developed over the period 1915-1940, the site has been declared a UNESCO World Heritage Site. 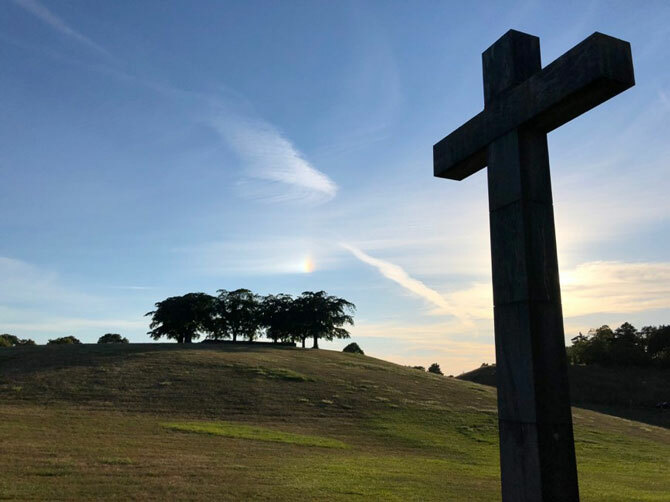 An evening walk through the site is a truly spiritual experience, with long shadows of trees drawing interesting patterns on the lawns and meditation hill of the central ceremonial space. Among the trees we located the Woodland chapel, designed with a curious mixture of Nordic modernism, and vernacular architecture, with the entrance portico echoing the trunks of the surrounding trees. The experience was well worthwhile. Hammarby Sjostad is one of the best-known examples of sustainable urbanism in Scandinavia. An abandoned industrial site slated to be the location of the Olympic village in the event Stockholm won the 2012 bid for the Olympics. Although the Olympics went to London, the municipality and a series of developers decided to go ahead and build the eco neighborhood. In the planning process public transport was secured (with a tram and ferry connecting the neighborhood to the city center), a 50% reduction in energy consumption in the building typology was pledged and an ambitious program for recycling and production of biomass energy was implemented. The quality of the public space and park areas, designed to manage storm water and as sustainable drainage systems, with an extensive network of public paths and bike routes, as well as garden courtyards between the 4-5 story buildings, makes this neighborhood a very desirable place to live for couples with young children. The eco experiment has proven to be a success with housing having increased in value, no doubt due to good communications, quality of architecture and the abundance of green areas. Only a half hour away from the capital, a must for plant lovers, is the Linnaeus house and botanical garden in Uppsala, where he developed his botanical classification system as a medical professor at the University, the oldest in Scandinavia. The original botanical garden was completely lost, but has been restored with all its original species, relying on the copious notes left by this great 18th century scientist. From Stockholm we flew to the island of Gotland, a popular Swedish summer retreat. Originally it was populated by the Vikings, with an abundance of remains found all over the island. Visby, its capital, became a Hanseatic league city in medieval times, given its strategic location in the Baltic Sea, and still maintains its protective walls and medieval street structure intact. We also visited the island of Faro, accessed by ferry, where Ingmar Bergman settled in his later years after falling in love with the place and culture during the filming of ´ Through a glass darkly` in 1961. We discovered idyllic beaches, strange rock formations and an agricultural landscape dotted with characteristic farm buildings. But the place which most surprised us on this day excursion, back on the main island, was the Furillen hotel, a fantastic retreat created in an abandoned cement factory, where the industrial ruins, the mountains of gravel, the rocky shoreline and the late afternoon light created a surreal landscape to be contemplated from the hotel, a low building with minimalist decoration using abundant polished cement, an appropriate backdrop for the ubiquitous plant ornaments. We also visited the city of Gothenburg, the Venice of Scandinavia, enjoying the views both from the canals and walking the streets with abundant neoclassical architecture and an active restaurant scene, including a temple to eat shellfish! We visited the Fine Arts museum to see Nordic landscape painting and we enjoyed the fabulous installations by the Japanese artist Chiharu Shiota. We finished our trip with a couple of relaxed days north of Gothenburg on the Bohuslän coast, where we enjoyed breathtaking sunsets on the rocky cost from our cottage perched on a steep hillside. During the whole trip the Swedes were constantly mentioning the lack of rain and the dryness of the countryside and gardens. May and June had been the hottest months on register. While travelling, news of the first forest fires began, although we did not see any ourselves. By mid-July 50 forest fires were raging throughout the country and finally international assistance was requested to put out several fires that were out of control. With little infrastructure to store water for agriculture, in spite of the abundance of lakes, Sweden also has to confront erratic climatic events that will without doubt become more frequent in the future. Meanwhile, in Spain the summer has been mild compared to others. The world turned upside down.